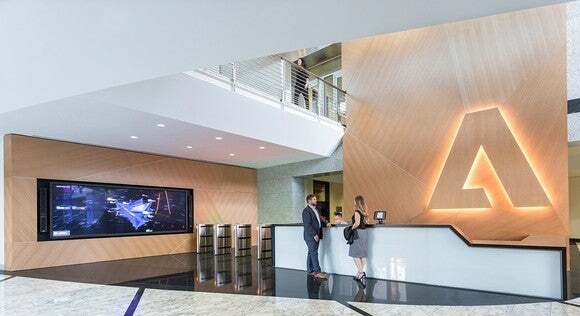 Adobe Systems Incorporated (NASDAQ: ADBE) announced better-than-expected fiscal first-quarter 2018 results on Thursday after market closed, setting another new high mark for revenue as the creative community continues to embrace its latest cloud-based subscription software. Let’s zoom in for more color on how Adobe kicked off the new fiscal year, as well as what investors should expect from the company as we look ahead. DATA SOURCE: ADOBE SYSTEMS. *FOR THE PERIOD ENDED MARCH 2, 2018. What happened with Adobe Systems this quarter? On an adjusted (non- GAAP ) basis, which excludes items like stock-based compensation, net income grew 64.9% to $1.55 per share. By comparison, Adobe’s guidance ( provided last quarter ) called for lower revenue of $2.04 billion and adjusted earnings of $1.27 per share. Digital Media segment revenue climbed 28% year over year — above guidance for 25% growth — to $1.46 billion. Digital Experience segment revenue increased 16% — above guidance for 15% growth — to $554 million. Digital media annualized recurring revenue (ARR) rose by $336 million sequentially to $5.72 billion. Adobe generated cash flow from operations of $990 million, while deferred revenue went up 25% to $2.57 billion. Repurchased 1.6 million shares for $301 million during the quarter, leaving roughly $1.6 billion remaining under Adobe’s repurchase authorization. “Adobe’s outstanding growth is driven by enabling our customers to be more creative, work smarter and transform their businesses through our relentless focus on delivering innovation and intelligence across our solutions,” said CEO Shantanu Narayen. For the current fiscal second quarter of 2018, Adobe expects revenue of $2.15 billion — slightly ahead of investors’ expectations for $2.14 billion — once again assuming digital media segment growth of 25% and digital experience growth of 15%. That should result in GAAP earnings of $1.16 per share and adjusted earnings of $1.53 per share, the latter of which sits roughly$0.02 per share above Wall Street’s models. That said, Adobe didn’t provide any updates to its previously issued guidance for all of fiscal 2018, which was updated in January to model 19% full-year growth in revenue to $8.725 billion and adjusted earnings of $6.20 per share. But that’s not particularly concerning when we couple Adobe’s slight outperformance this quarter with its history of underpromising and overdelivering. In the end, there was little not to like about Adobe’s latest quarterly beat, as the company’s transition away from permanent licensing and toward a cloud-based subscription model continues to pay off nicely. So, with shares climbing to an all-time high in response, I think investors are right to be pleased. David and Tom just revealed what they believe are the 10 best stocks for investors to buy right now… and Adobe Systems wasn’t one of them! That’s right — they think these 10 stocks are even better buys. Steve Symington has no position in any of the stocks mentioned. The Motley Fool recommends Adobe Systems. The Motley Fool has a disclosure policy . Why Did Adobe (ADBE) Stock Hit a New High on Wednesday?